After careful and rigorous testing of PICASO, the trial run by the Department of Biomedicine and Prevention, University Tor Vergata of Rome, Italy, enrolled its first patient on 28th march 2018. The first patient in the PICASO trial is 63 years old and has 8-year history of Parkinson’s disease. The patient is now actively using wearable and other devices for home monitoring of important health parameter and sharing the data with the trial clinicians via PICASO. The first step in preparation for deployment with a patient was for the trial physician to define the patient’s unique care plan using the Care Plan Manager component in the PICASO Clinician Dashboard. 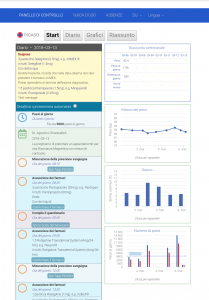 The care plan is transferred to the Patient Dashboard in the form of a diary that gives the patient an easy overview of the actions he/she must complete at specific times during the day, such as taking blood pressure before breakfast and confirming medical intake at certain times during the day etc. In a meeting with the patient and his family members, the trial clinician, Dr. Agostino Chiaravalloti, gave a careful instruction and tutorial in how to use PICASO and the home-monitoring devices. The patient then did a complete test of the solution and its functionalities under the supervision of Dr. Agostino Chiaravalloti. 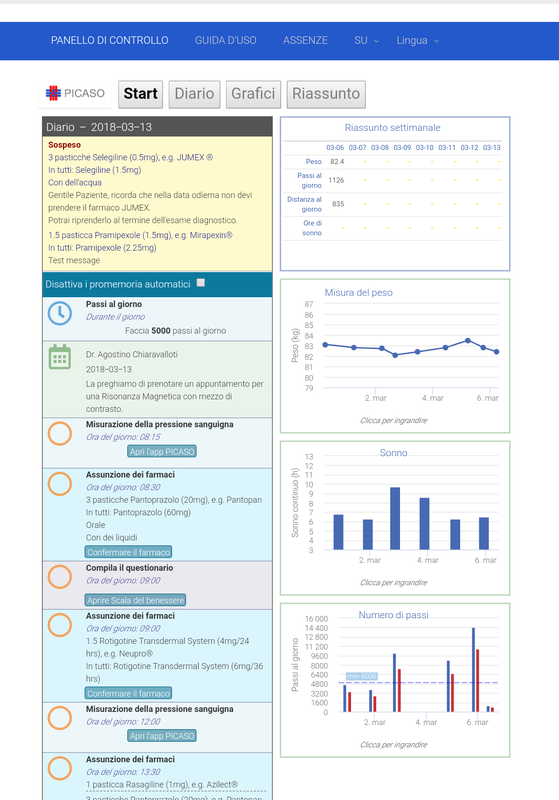 The patient and his family members were very positive about the solution and immediately saw a benefit in how PICASO can support correct drug intake with the diary and reminder functionalities.